For those of us old enough to remember a time before Android, Samsung, LG, HTC and so on, there was only one manufacturer who would have been on your lips. Nokia. 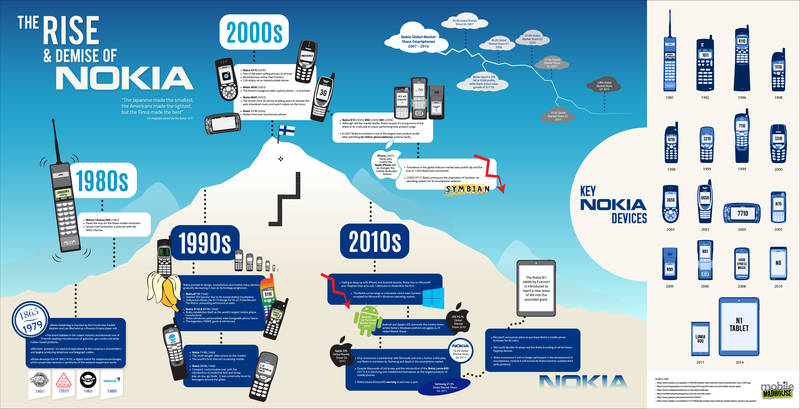 The Finnish company were 'it' went it came to mobiles and especially back in the early 90's and even the noughties. Motorola actually manufactured the first mobile phone I ever remember buying, but after that it was Nokia all the way. In fact, undoubtedly, the Nokia 3310 still remains my favorite phone of all time. Of course, it did not have all the features a smartphone today has, but in truth, they were not needed then. However, the Nokia 3310 was simply indestructible. In was built to last and last it did. I bet you can still even today find a few of them knocking about on eBay. It should not be too hard as the Nokia 3310 quickly became (and still is considered) one of the best selling phones of all time. Another prime example of who leads the smartphone market is Hollywood. Nowadays, you can literally date a movie by what phone the lead character is using. Rewind back to 1999 and the biggest film of the year (if not the decade) was The Matrix. Still a cult classic today. And even Neo could not escape having a Nokia phone. The Nokia 8110 actually. Aka The Matrix Phone. Aka the 'banana phone' due it's bending and curved design (take that LG with your Flex phones). So, when you combine the accolades of being the starring phone in the movie of the decade along with having one of the biggest selling phones of all time you kinda get an idea of how big Nokia was in the mobile phone realm. That said, they did have some practice as their first Nokia branded phone was released in 1987 under the 'Nokia Mobira Cityman 900' guise. With a name like 'Cityman' and being from the 80's you can pretty much guess what market this was aimed at. However, times do change and in today's market we find Nokia to be much more of a minnow then the Great White they once were. Things started to go bad in particular, in 2007. Their sales had been somewhat on the slide since 2005, although they still did remain the main mobile maker in 2005 and 2006. But in 2007 two significant events occurred which effectively started the fall of the great Finnish warrior. The first of these events was when Nokia fell victim to one of the largest ever product recalls in which they admitted as much as 46 million phone batteries could be faulty. The other big event which occurred in the same year, was the unveiling of Apple's iPhone and also Android's 'Open Handset Alliance' (OHA), resulting in the end of Nokia as we knew it. Following on from Apple's almost immediate take-over (and a rocky telecoms market in general), Nokia continued to dip and slide. There was one possible saving grace which came in the form of Android, but Nokia choose not to go with the Android movement and instead opted for their own operating system, Symbian. Over the next few years, Nokia struggled greatly to keep up with the movement of Android and Apple who by 2010, had pretty much dominated the market with a market share of 22.7% and 15.7% for 2010, respectively. By the same time, Nokia's had launched the Lumia range and dropped Symbian in favour of Microsoft's Windows operating system. However, it seemed the damage had been done as their market share for 2010 was as low as 4.2%. The deterioration of the company continued (in all respects) with market share dropping and the company effectively being disbanded as a separate smartphone entity. Fast forward to today and we find ourselves with Nokia still surviving. They are not the same powerhouse anymore, and not even the same company. But the brand lives on with a renewed purpose and ironically three android devices under their belts. In fact, the more recent Nokia N1 tablet is receiving very warm praise which leads to the question - what might have happened if Nokia had actually joined the OHA back in 2007 along with HTC, Samsung and Sony? After all, these three companies are pretty much the backbone of the Android smartphone world now and Nokia might well have been right there with them, if they had opted for android. In fact, they could have maybe even risen back to the lofty heights of world's largest phone manufacturer, instead of Samsung. Of course, these are all maybes and either way, the life, rise and fall of Nokia was a great one. You can see the history in a very neat and well-designed infographic by clicking the source link below.